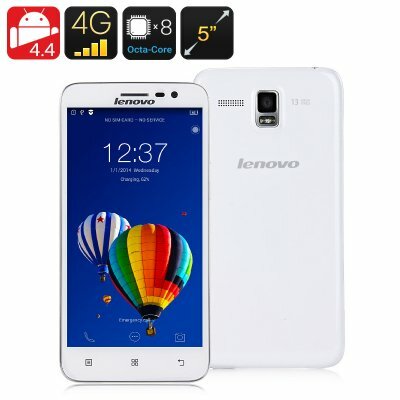 Successfully Added Lenovo A806 Smartphone - Octa Core CPU, 2GB RAM, 4G, 5 Inch 720P Screen, Hot Knot, Dual Band Wi-Fi (White) to your Shopping Cart. 4G SIM card slot brings you access to the fastest cellular data speeds available. The 5 inch Lenovo A806 offers superb viewing with its crisp 5 inch screen that crams in almost 300 pixels per inch so you can enjoy pin sharp images. Running on a MediaTek 6592 Octa core CPU and with 2GB of RAM it brings a good balance between performance and longevity, ensuring an efficient performance that can happily handle games and movie viewing without draining your battery. With the classic Android 4.4 OS you can enjoy a tried and tested user interface that benefits from voice commands with OK Google and is finely optimized to deliver only the best from your phone. You get 16GB of memory space to play with on the Lenovo A806 but this can easily be boosted with a micro SD card allowing you to add up to 32GB of further storage. The SIM slot takes 4G compatible cards and allows you to connect to band 1 (2100MHz) and band 3 (1800MHz) frequencies, where you can enjoy super fast downloads that make it possible to steam HD video direct to your phone, a true winner for movie lovers. The phone is well equipped for wireless communications, as well as the standard Bluetooth 4.0 the Lenovo A806 Smartphone has dual band 2.4G and 5G Wi-Fi connectivity. this means you get the fastest wireless network connections so uploading photos or surfing the web wont require any waits. With Hot Knot technology you can enjoy simple contact data transfer between other enabled devices much like the way NFC works. When it comes to snapping selfies there is a 5MP front facing camera but the real gem in thins phones crown is the 13MP rear view camera that sits alongside a bright LED light so you get good quality shots night or day to impress your friends and show of great moments. The Lenovo A806 Android Smartphone comes with a 12 months warranty, brought to you by the leader in electronic devices as well as wholesale android smartphones..